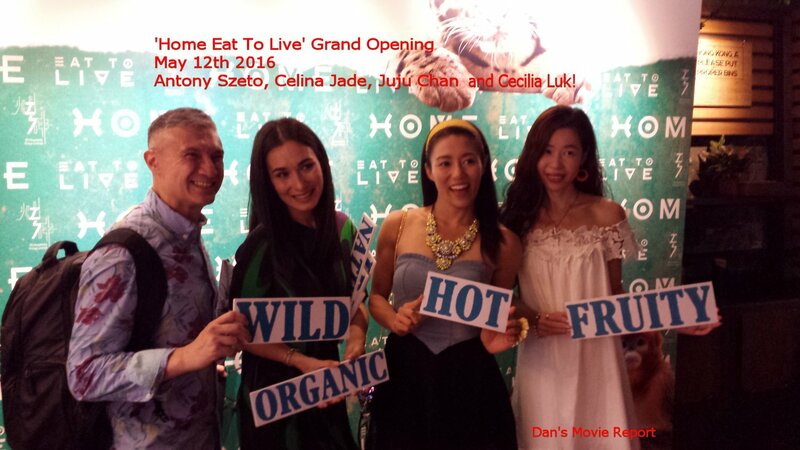 Dan's Movie Report: Home Eat To Live: Grand Opening in Hong Kong! New Organic Food Venture from Celina Jade and Christian Cgm! Home Eat To Live: Grand Opening in Hong Kong! New Organic Food Venture from Celina Jade and Christian Cgm! Above Photo: Home Eat To Live Grand Opening Party! May 12th 2016! In Photo: L to R Antony Szeto, Celina Jade, Juju Chan, and Cecilia Luk! Actress and partner Celina jade is also heavily involved in the new venture with Christian. HOME - Eat to Live is a fast-casual, sustainable, healthy restaurant that is committed to serving the purest, highest quality plant-based cuisine & products in a spirit of friendliness, fairness & community. We strive to use organic produce whenever possible and source as much of our ingredients locally as we can from a network of local farms as well as our proud partner farm in the New Territories, HOME by Kau Kee. At HOME, we aim to foster a vibrant community of health-minded individuals who feel free to unleash, and express, their joyful life force over delicious food in a relaxed, warm & contemporary environment, a true HOME in the city where people can feel loved, supported and cared for.